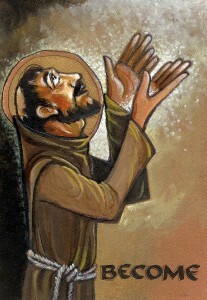 St Francis didn’t l eave us many examples of written prayers, rather, he left us his lived example of how to pray. Francis’ prayed with his whole being and was lifted up by the Presence of God which surrounded him. He sang, laughed, cried and danced to the awesome Majesty of God. Francis often retreated for times of silence and solitude when in meditation he was raised to the heights of contemplation. Today, we often like to fill up all our time, even our time of prayer. Francis calls us to enter into the silence of our hearts and demonstrates to us that, in this place, we will find the light of God who will, in turn, illuminate our sense of self and other. Francis began this journey of contemplation by asking, ‘Who are you Lord and who am I?’ a path of prayer that wound conclude with the understanding that Christ was both, “My God and my All!” These simple and humble, invocations allowed him to recognise himself in the light of God’s Supreme Goodness and Love. One of his most beautiful prayers is his ‘Prayer for Enlightenment’ (sometimes called ‘The Prayer before the Crucifix’ ). Francis prayed this as he wrestled with what God was asking him to do and in it he asks God to ‘cast his light’ into his darkness.